2. Toss together the flours and baking powder, then rub through the butter until the mixture resembles breadcrumbs. Add the salt, sugar, zest, cranberries and chocolate chips, and toss through. 3. In a small jug, beat the eggs with the buttermilk then add to the dry ingredients. Bring the mixture together into a fairly damp dough. Flour the worktop lightly and with your hands, very lightly knead for just ten seconds, until the mixture is even and coherent. Form the dough into a 22cm circle, then flatten into a disk. With a floured, sharp knife, cut the dough into 8-10 triangles and arrange them well spaced on a baking sheet. Leave the scones to rest for 15 minutes. 4. With a pastry brush, glaze just the tops of the scones with the beaten egg and sprinkle over the caster sugar, then bake for 15-20 minutes, until the scones have puffed up and are a gorgeous golden brown. 5. 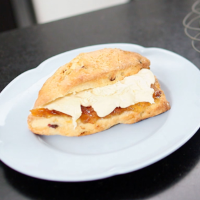 As soon as the scones come out of the oven, slide them onto a wire rack and cover with a slightly dampened tea towel – this helps to keep them pillowy and soft.